Author Mary Sojourner will be hosting a one-day Creative Nonfiction and Fiction workshop at the Piper House at Arizona State University on Saturday, January 16 from 10am to 5pm. “The Forbidden is a chimera, a shape-shifter. A woman writing during the seven hundred years of the Inquisition could be killed simply for writing anything. Books were once banned for sexual content. Sexual content now sells everything. Our family, ethnic group, gender and culture impose sanctions against the forbidden. But the deepest rules about what we may or may not write lie within us. We have been and are forbidden to write about our sexuality, our fear, the realities of our aging, our loneliness, our secret delight. Can’t make the workshop? 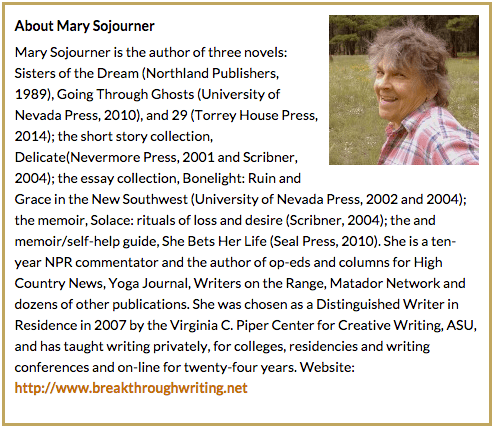 Mary Sojourner also provides weekly writing tips, challenges, prompts, and exercises through her website.